Product prices and availability are accurate as of 2019-04-22 13:45:26 UTC and are subject to change. Any price and availability information displayed on http://www.amazon.com/ at the time of purchase will apply to the purchase of this product. Twenty years after the fact, the mere mention of the 1992-93 NHL season brings back vivid memories for hockey fans across North America. The last time that the Montreal Canadiens hoisted the Stanley Cup, Wayne Gretzky's last appearance in a playoff final, and Mario Lemieux's most inspirational season, these years are rightly considered some of the greatest in NHL history. 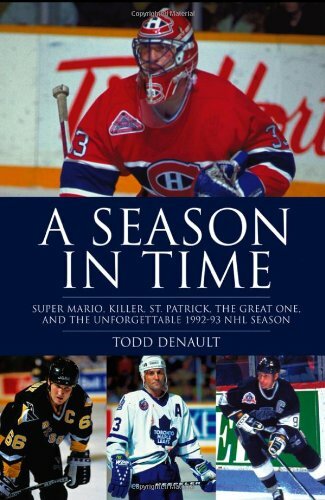 Now, in A Season in Time: Super Mario, Killer, St. Patrick, the Great One, and the Unforgettable 1992-93 NHL Season, acclaimed hockey writer Todd Denault looks back to those heady days. The story of a truly magical age for hockey in North America, a time that came to be known as "the last great season," where hope reigned, where the unthinkable seemed possible, and some of the greatest legends the game has ever seen took to the ice, A Season in Time is a true trip down memory lane. Covering the stories of Mario Lemieux, Wayne Gretzky, Patrick Roy, and Doug Gilmour, and capturing the frenzy and excitement that hasn't been seen since, the book is essential reading for hockey lovers of all ages. Insightful and informative, A Season in Time is a loving look back at a season for the ages.